In dentistry, resorption is a term used when referring to changes that take place with respect to the roots of your teeth that are not exclusively the result of decay or fracture. There are two areas where resorption can start, internally and externally. Internal resorption starts at the innermost surface of your tooth’s root – where the root surface forms the boundary of your tooth’s nerve chamber. External resorption, as the name implies, starts at the outermost surface – where your tooth’s root connects to your jawbone through the ligament that holds it within its socket. Both processes are destructive in nature and can lead to the loss of your tooth without treatment. In some cases no treatment is possible, and tooth loss is inevitable. What is Internal Root Resorption? 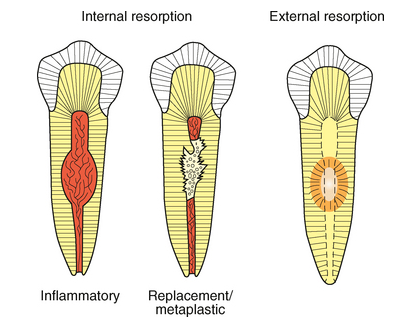 Internal root resorption is a relatively simpler phenomenon than its external counterpart. Internal root resorption is usually thought to be the result of long-standing chronic inflammation in your tooth’s nerve (technically known as the pulp) and is asymptomatic more often than not. This inflammation can be the result of irritation (such as may arise after a deep filling has been placed) or trauma, among other causes. This resorption is usually progressive, and if it proceeds all the way to your root’s outer surface, treatment will be impossible. Early treatment is most successful, but even extensive cases can sometimes be reversed. External resorption is more difficult to treat. It tends to be more aggressive, is usually asymptomatic and is characterized by an invasion of blood vessels and connective tissue into your tooth’s root from its surrounding structures that occurs at various points below the gum line. Color changes in your tooth may indicate this type of resorption, but most often it can only detect with x-rays. Trauma and orthodontic movement appear to be the most common causes of this condition, although cysts and tumors, as well as adjacent impacted teeth, can play a role. External resorption associated with orthodontics (braces) occurs at the tip of your tooth’s root, is typically minor in severity and self-limiting in the vast majority of cases. Cervical (up at the neck of your tooth’s root by the jawbone line) external resorption is treatable and can be resolved as long as it is caught early enough. External resorption detected at the midpoint of the root, below the surface of your jawbone, is the most difficult to remedy and often dictates extraction as the only possible treatment. The earlier any external root resorption of your tooth is detected, the easier and more successfully it can be treated. This is why you should have a full mouth series of x-rays taken at least every three years and teeth that have suffered trauma should be x-rayed even more frequently. Treatment of internal resorption normally consists of root canal therapy (technically known as endodontics), whereby your pulp is removed from its chamber along with any inflammatory agents responsible for the disorder. The progression of this disease is usually slow enough where routine x-ray examination will find it in time. This is why it is very important that you have all necessary x-rays taken at regular intervals. External resorption that can be cured requires treatment that entails removal of the tissue invading the root of your tooth, chemical treatment of the debrided root surface to prevent recurrence followed by replacement of the lost root structure with some kind of restorative material. More advanced cases may affect your nerve necessitating endodontics. If the external resorption is too extensive, which is more often the case than with internal resorption, no treatment may be possible, and your tooth will have to be removed. Again, it is extremely important to have all necessary x-rays taken on a consistent basis.